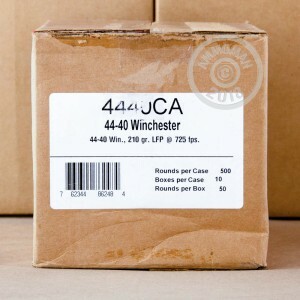 This 44-40 ammunition is optimized for cowboy action shooting and uses a light target load that keeps recoil down to promote rapid, accurate fire. Each cartridge in this case of 500 fires a 210 grain lead flat nose bullet at a muzzle velocity of 725 feet per second. The flat nose profile provides safety in tubular magazines and nice round holes in paper targets, while the bare lead bullets help prevent damage to steel targets commonly used in action shooting. 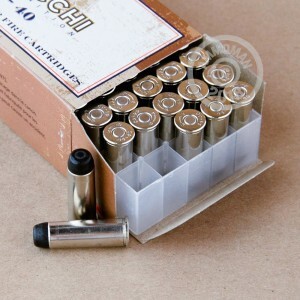 Fiocchi is one of the largest manufacturers of action shooting ammo on the market. 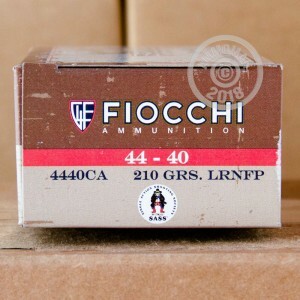 Although the company is based in Italy, its US division loads most of the Fiocchi ammo sold in America in Ozark, Missouri. Grab this case or any other items totaling $99 or more at AmmoMan.com and earn free shipping on your entire purchase. There's no added handling fee, no shipping zones to calculate, and no codes to redeem.